The FNW figure SWG spiral-wound gaskets are made of a preformed metallic v-shaped strip and a soft filler material wound together under pressure, with an outer guide ring. The winding is manufactured in the form of a spiral with filler material between the windings. The filler materials fill the irregularities of the flanges. The external guide ring has the function of centering the gasket in the flanges and gives the sealing elements additional resistance against line pressure and excessive bolt torque. FNW spiral-wound gaskets are made for applications with high temperature variations (thermal cycling), and/or pressure variations, and/or flange rotation problems etc., and where gaskets with adequate residual stress (stress retention) and flexibility are needed. 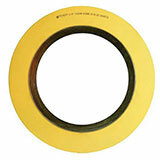 1/2" To 3" 300# Gaskets Are Multirated & Stamped "3/600#"